It might seem a little early, but it’s time to start dusting off your wish list for the upcoming holidays! In my family, we create very detailed wish lists, so that everyone gets gift they actually want and will use. Over the next few weeks, I’m going to help you create your perfect wish list — or find the perfect gift for someone on your list. 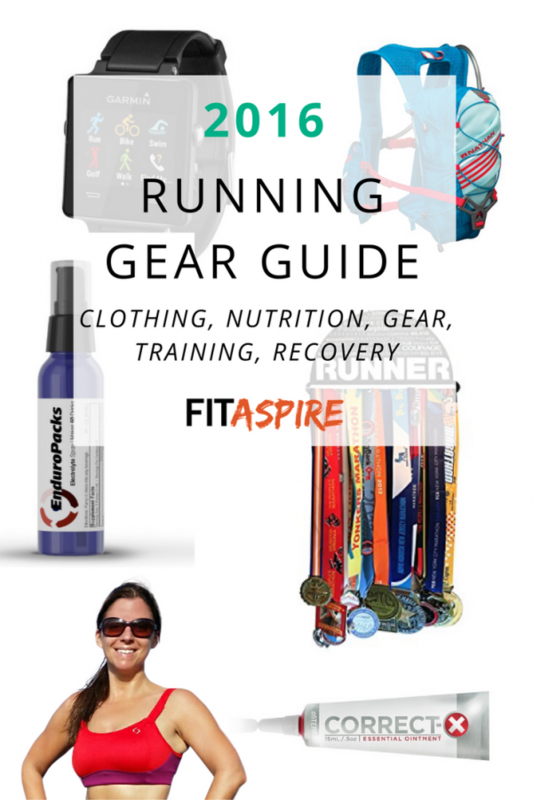 And I’m kicking things off with my running gear guide. 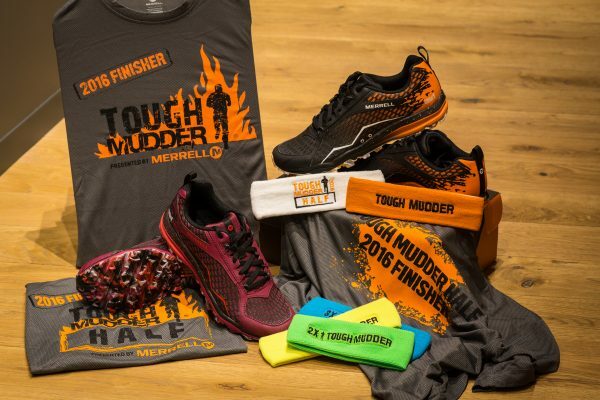 This running gear guide will cover everything from clothing, nutrition, & training resources. Most products are great for men & women, but I have noted gender-specific recommendations next to those items. Note: Some of the links below are affiliate links, which means I earn a small commission when you make a purchase after clicking that link (at no cost to you). As always, I only recommend products I have tried and would share with my family and friends. Thank you for supporting FITaspire through your purchase! These are my favorite running shorts by far, the perfect length! The fabric is so light and comfortable, you barely notice you’re wearing shorts. If you prefer a different length, a shorter and longer version of this style to choose from. These socks come just high enough over your achilles that it prevents chafing from your running shoe and it stays dry. I’ve even worn these socks on a long run with two river crossings without any problems. I’ve worn this style of sports bra for over a year now and I’ll be restocking with the same brand this month. They have tons of different colors and color combos to choose from, so you can find one that fits your style (or my brand colors, in this case). Cold weather running is coming and comfortable glove liners are key to keep your hands warm and dry. I would wear these gloves by themselves in cool temperatures and layer a fleece glove when it gets even colder. My ears are one of the first things to get cold on run & these ear warmers are a comfortable way to keep them cozy. BAMR Bands is a small business owned by fellow run coach, Katie Heddleston, and she donates a portion of each purchase to charity! If it’s not quite as cold outside, these BAMR Bands headbands come in tons of different colors & patterns. I switched to a running backpack for hydration earlier this year and it’s been one of my favorite purchases. I wear this during races, training, and even hiking trips. Most runners have dealt with chafing at some point in their training or racing. CorrectX is a natural, non-toxic alternative to protect your skin from chafing (and soothe skin irritation). Kirk & I both wear the Garmin Vivoactive every day as our watch, step tracker, and sleep tracker. And when I head out for a run, it also serves as my GPS tracker. If you’re looking for more advanced GPS tracking features, you may prefer the Forerunner. A must-have for anyone who heads out int he dark for the occasional run. Nothing fancy needed, I’ve had my Petzl headlamp for over 10 years & it still works great. And it doubles as a great tool for camping trips. Another requirement for night running, to make sure you are visible to drivers on the road. This new version includes LED lights to make you even more visible and is on my own wish list. When I did my first triathlon, I learned about lock laces to replace the normal shoelaces in my running shoes. I can’t imagine not using these now. Once you adjust the tightness to your preferences, you slide your shoes on and off with no adjustments. My favorite nutrition product for all endurance sports. Made with a unique slow digesting carb, it will help keep your blood sugar stable which is primary goal of endurance nutrition. I take one scoop before runs over 90 minutes and up to 2 hours without the need to refuel. A natural electrolyte product with no added sugar or artificial flavoring. You can add this to water or your sports drink of choice. Before long runs or tough workouts, it can be helpful to have an extra kick. This is a stimulant-free, natural alternative to other pre-workout options on the market. I use this before workouts for energy & focus without the jittery feeling. Great for deep self-massage and and particularly good for anyone dealing with plantar fasciitis. Massage is a key injury prevention habit, so this is a good way to get some of the benefits at home. Another key habit for injury prevention is foam rolling. This trigger point version adds something extra to your time spent with your foam roller. I love this sports rub to help with relief & recovery of sore muscles after a tough workout. A natural alternative to provide immediate cooling & soothing to targeted areas. If you enjoy racing, this is a great way to display your medals for all to see. I admit that we have piles & piles of race medals on a guest room bed right now, so this is on my wish list. For both injury prevention & improving running power, strength training should be a regular part of your training. You can download a 2-week training program for FREE, or the full 6-week training program is just $9.99 (for a limited time). For runners averaging at least 18-20 miles a week and want to improve their time, this 10-week complete training eBook is a great way to try out structured training without a coach. Includes both running workouts & strength training to help you get the best results. * I personally use doTERRA products in daily health & fitness routines. You can purchase any of these products listed at retail prices on in my doTERRA shop (just click “Shop”), or you can learn more about buying at wholesale prices (25% discount). Do you make a detailed wish list or prefer to find the perfect gift on your own?